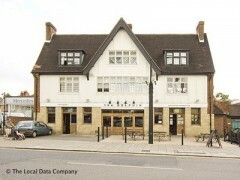 About: The Dolphin is a large family-friendly pub which has a large garden and a food menu. It has pool tables, Sky television, and fruit machines. According to the designers the garden at The Dolphin in Sydenham was a response to the Tudor style façade of the pub itself. A modern take on the Tudor garden ensued and what the pub is left with is one of the most original – not to mention vast – beer gardens in London. Pruned hedges, a water jet and a steel pagola will swallow entire afternoons in this awesome exterior.